It’s always a strange scene when a performer wouldn’t be allowed to even enter the venue if not for the fact he’s the night’s entertainment. Tonight at the Sunset presents one of those situations as Howler mastermind Jordan Gatesmith is still two years shy of the legal drinking age. As the story goes, Jordan didn’t even pick up the guitar until five years ago. American youth. What can’t they do? 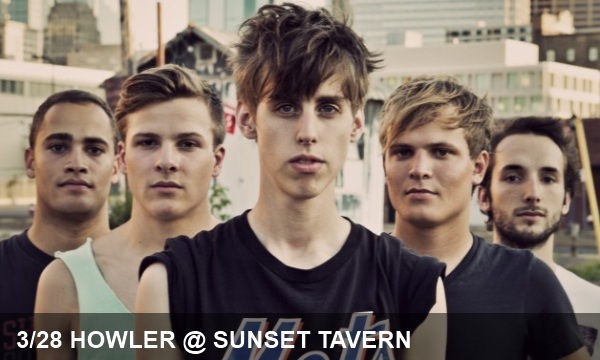 Luckily for those of with the proper identification, Jordan and the rest of the touring band for Howler will be bringing the band’s catchy, often danceable surf rock to one our city’s most intimate venues tonight. Combining half century-old rock-n-roll sensibilities with an 80s punk aesthetic, Howler produces the type of music that might make you feel just as alive as you did when you first heard The Strokes over a decade ago. As the young band from Minneapolis claims The Cramps, The Replacements and The Velvet Underground among their top influences, music fans longing for punk-infused rock with retro tendencies will certainly feel at home, if not even older, at the Sunset tonight. Be sure to arrive early to see the entire Rough Trade lineup.